This CIMA research report builds on a pilot study undertaken by the authors. A framework for risk management was developed as a result of the research. 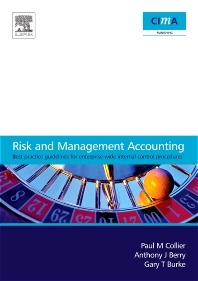 This research report describes the results of a major survey-based research study entitled ‘Risk and Management Accounting: The development of best practice guidelines for enterprise-wide internal control procedures to identify and manage risk; the contribution of and the consequences for management accountants’. Professor Business School, Manchester Metropolitan University. Doctoral student, Aston Business School.